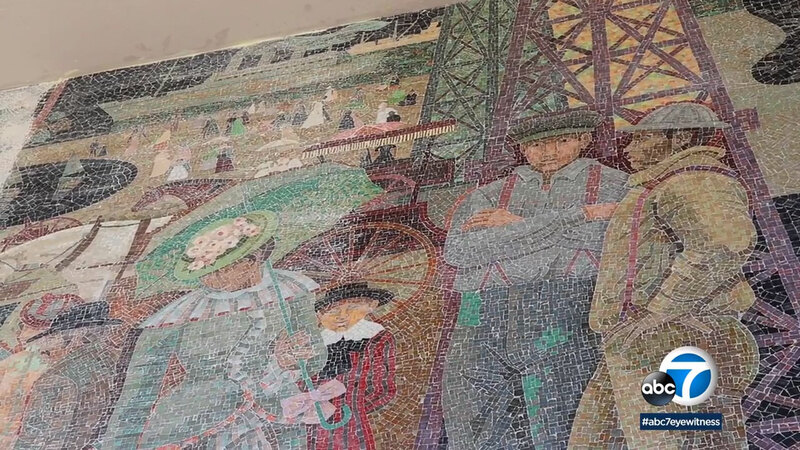 LONG BEACH, Calif. (KABC) -- Workers are painstakingly restoring a classic piece of public art. The once blank panel on the International City Bank in Long Beach has been hiding it for decades. Under the white layer of paint is a mosaic from the Millard Sheets Studios. Millard Sheets is responsible for vibrant mosaics on bank buildings from the 1950s through the 1980s. This mosaic is believed to be from 1979. Rockwell Properties, the new owners of the building and International City Bank, are footing the bill to restore the artwork. Workers say whoever covered up the mosaic did so with care with the intention of it being uncovered. The unveiling of the mosaic is scheduled for July.